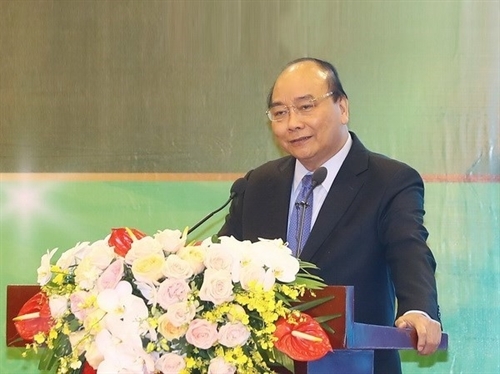 Prime Minister Nguyen Xuan Phuc has urged the agriculture sector to switch from the mindset of agricultural production to an agricultural economy and international integration in order to create a revolution in the development of agriculture, farmers and rural areas. Speaking at a national teleconference reviewing the ten-year implementation of Resolution 26-NQ/TW on agriculture, farmers and rural areas adopted at the seventh plenum of the 10th Party Central Committee in Hanoi on November 27, PM Phuc underlined the need to identify opportunities, challenges and limitations to roll out strategic orientations for the sector, thus spurring its development, especially in the context of the fourth Industrial Revolution. The settlement of issues regarding agriculture, farmers and rural areas is a common task of the entire political system, he said, asking ministries, agencies and localities to take solutions to deal with small-scale production and meet new requirements of agricultural and rural development. The PM pointed out a list of tasks for ministries, agencies and localities, such as natural disaster prevention and control, adaptation to climate change, clean agricultural production, improving mechanisms, policies and laws and removing difficulties facing investors and businesses. Agricultural production should go in tandem with market development and capital supply, he said, requesting ministries and agencies to pay more attention to the export markets, and the banking system to set forth necessary mechanisms to serve agriculture, farmers and rural areas. The comprehensive, sustainable building of new-style rural areas should be connected closely with urbanization, environmental protection and preservation of traditional culture, the PM noted. Resolution 26-NQ/TW, the first of its kind issued by the Party, has given a facelift to the agriculture sector and rural areas, with role and living standards of farmers improved significantly, he said. PM Phuc asked the steering committee for the review of the implementation of the resolution to collect opinions through thematic workshops to report to the Politburo for the issuance of another resolution in the sphere. According to a report presented by Cao Duc Phat, deputy head of the Party Central Committee’s Economic Commission, aquaculture production and animal husbandry accounted for 26.2 percent and 27.2 percent of the agriculture sector’s total value in 2017. Export staples such as rice, rubber, coffee, cashew nuts, shrimp, fish and fruits have gained firm foothold in foreign markets, contributing to a 2.66 percent growth in the agricultural sector’s gross domestic product (GDP) last year. Up to 3,069 communes nationwide have been recognized as new rural areas, and 7.2 million rural laborers have received vocational training, the report said.